Halloween night isn't renowned for it's culinary delights - sweets and candy seem to take centre stage however bonfire night seems to provide a bigger variety of home baking opportunities. Both sweet and savory tastes can be catered for, many of us will be preparing bonfire cooked jacket potatoes, bangers, baked beans, toasted marshmallows, treacle toffee and toffee apples. One treat that is somewhat unknown and therefore perhaps less popular but no less delicious, is sweet and sticky Yorkshire parkin. Originally derived in the north probably sometime around the Industrial revolution this humble ginger cake really packs a punch, especially when left to mature for a few days. It is made from treacle, golden syrup, ginger and oats as these items would have been available to the working classes albeit as a treat during the 18th century. It was originally eaten at winter festivals but it is delicious at any time of the year. 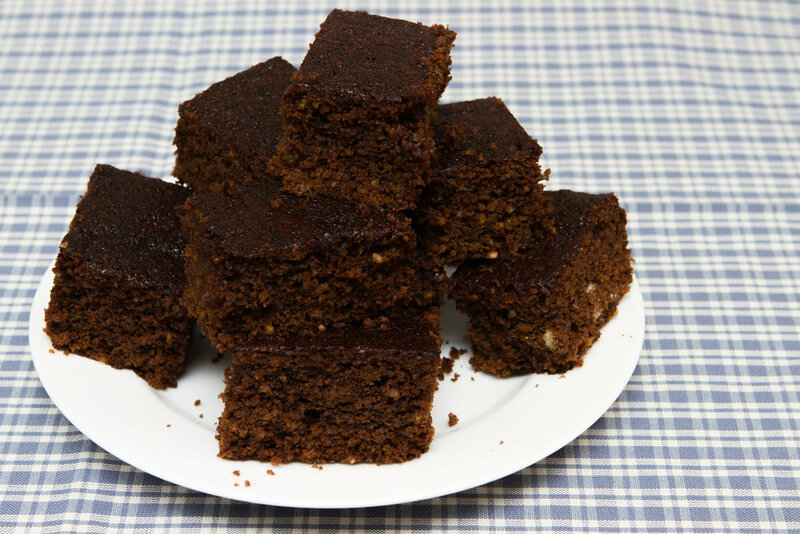 So why not spice up Bonfire night with a piece of parkin. The recipe below should cut into 16 pieces and it is imperative not to eat it until it has matured in an airtight tin for at least three days - however tempting it may be! Grease and line a 20cm square tin and preheat the oven to 150 degrees. Weigh out the dry ingredients and place in a large bowl. Next gently melt the butter, lard and golden syrup in a pan and then mix into the dry ingredients. Put the milk in a pan and bring to the boil. Whilst the milk is heating, sprinkle the bicarbonate of soda over the mixture. Pour the boiling milk over the mixture and combine well. Transfer the mixture to the tin and place in the oven to bake for an hour. Once cool, cut into squares and place in an airtight tin for three days to mature.